Copyright © Jerry King. All rights reserved. Used with permission. I think Big Shooter is on to something here. 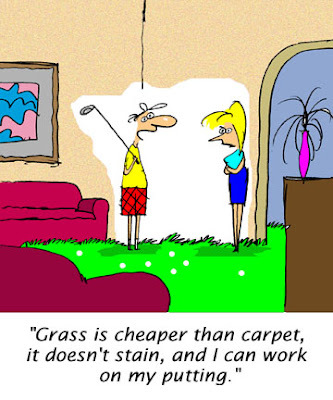 Recently, we kicked around the subject of carpet putting during the winter months. But, I ask you, why not grass? Jerry King is an award-winning cartoonist whose credits and clients include Golf Digest, United States Golf Association and Disney. His golf cartoons are featured weekly at ARMCHAIR GOLF. Carl Spackler would be proud. Great... Golf can be anywhere. Just like golf goals.It can be anything you want.